Whether you have a big plumbing project that you are working on, or are simply changing out a faucet in your bathroom, you may need to purchase flexible tap connectors to get the job done right. Plumbing doesn't have to be difficult. It is now possible to find a flexible tap connector that will meet your needs for the work you need to be done. At Buildworld, we stock a range of Flexible Tap Connectors. Select the right one based on your requirement. Flexible tap connectors come in a wide variety of sizes, and they can be used for both hot and cold water supplies. There's no need to find specialized tap connectors for either hot or cold water, making it easy to purchase the right connectors the first time. 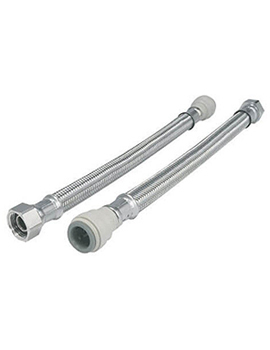 The wide variety of lengths and diameters available make it possible to purchase connectors you can use in almost any bathroom or kitchen situation. Eliminate the need to cut pipes, or to weld when you choose the right flexible tap connectors when you need to install taps in your bathroom or kitchen remodel. It's an easy, effective solution to traditional plumbing options that take more time and will cost you more money if you have to hire a professional plumber to do the work for you. When you have a plumbing need that requires replacing taps in your bathroom or kitchen, you can find the right flexible tap connectors without having to worry about any cutting or specialized fittings. If you complete plumbing work using this type of connector, you can expect that the work will be as permanent as if a professional plumber came and welded pipes instead. With the variety of materials available to complete plumbing projects, it's now possible to do more plumbing work on your own with ease. All you need to do is measure the area and know the diameter of the pipe you fit to find the right pieces to purchase.